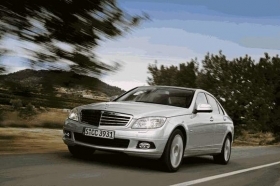 Daimler will move some C-class production to U.S.
LOS ANGELES -- Mercedes-Benz will add production of C-class sedans to its plant in Vance, Alabama, starting in 2014. Daimler AG CEO Dieter Zetsche, who participated in the creation of the Alabama plant project as a fast-rising executive in 1993, said in a statement released today from Stuttgart that the U.S. operation will take over about one-fifth of the model's global production. The Vance plant is currently the source of the Mercedes-Benz M-class, R-class and GL SUVs. While the plant expanded several times to keep up with a seemingly insatiable world appetite for the large vehicles over the past decade, the crashing U.S. SUV market has left the plant under-utilized for the past two years. The likely addition of the C class has been rumored among Mercedes' suppliers since last year as the Alabama plant struggled with reduced volumes and headcount reductions. Zetsche's statement said that moving C-class volume to the United States will require some shifting of products in Germany to protect jobs there. European C-class production from the Mercedes Sindelfingen plant, near Stuttgart, will be consolidated at the company's plant in Bremen. Bremen will hand off assembly of the SL roadster to Sindelfingen. Daimler's personnel head Wilfried Porth told a telephone conference there would be no job cuts in Sindelfingen and that the company planned to add 1,000-1,200 jobs in the United States starting in 2014. Daimler's plan marks another step in a broader strategy by global corporations to concentrate production and sales of products within the same currency or trade zone. Rival BMW recently increased production capacity at its U.S. site in Spartanburg, South Carolina, for similar reasons.